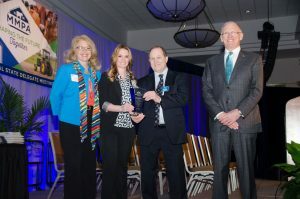 Regina Kopera, Site Leader of the Kroger Michigan Dairy and Rachel Hurst, Consumer Affairs Manager of The Kroger Co. of Michigan accepted the Valued Partner Award at the MMPA 101st Annual State Delegate Meeting on March 23 from Carl Rasch, Director of Milk Sales at MMPA and Ken Nobis, President of MMPA. LANSING, Mich.—MMPA today honored The Kroger Co. of Michigan with the inaugural Valued Partner Award at MMPA’s 101st Annual State Delegate Meeting. In conjunction with the award, MMPA announced the donation of 150 gallons of milk per day for one year—a total of 54,750 gallons— to recognize the 50th anniversary of Kroger’s Michigan Dairy plant. MMPA dairy farms have supplied the Kroger’s Michigan Dairy plant in Livonia, Michigan since it first opened in 1967 and the two organizations have sustained a partnership that extends into a variety of initiatives. Annually, Kroger welcomes a group of youth on MMPA’s 4-H Milk Marketing Tour to the Michigan Dairy plant to help the students learn more about the dairy supply chain. MMPA and Kroger have also partnered in dairy promotion programs through the “Pure Michigan” campaign and in-store promotions featuring MMPA farms. Last year, MMPA and The Kroger Co. of Michigan partnered on a milk donation initiative to support Flint, Michigan residents following the Flint Water Crisis. The Pediatric Public Health Initiative lists nutrition as one of the evidence-based interventions that will optimize the outcomes. Dairy is one of the foods encouraged for families to mitigate lead absorption and so MMPA and Kroger worked together to bring over 24,000 gallons of 2% milk to families in Flint in 2016. “Throughout the Michigan Dairy’s 50-year history, we are grateful for our relationship with MMPA and its dairy farmer members to produce quality products for our Kroger stores. The Kroger Co. of Michigan is honored to be recognized for this award today and proud to support the 150 gallon per day for one year milk donation,” Regina Kopera, site leader of the Michigan Dairy, said. At the 100th Annual State Delegate Meeting last year, MMPA announced a donation of 100 gallons of milk per day for one year to the Food Bank Council of Michigan. “The 100 gallon per day donation in recognition of MMPA’s 100th Anniversary was so successful and well received that our board of directors voted to repeat it this year and add 50 gallons per day donation in recognition of Michigan Dairy’s 50th Anniversary,” Nobis added. The milk donation of 54,750 gallons announced today will be contributed to the Food Bank Council of Michigan and distributed to their regional food banks which serve all 83 Michigan counties. Processing and packaging of over 18,000 gallons of the donation will be provided by the Michigan Dairy plant in Livonia. Kroger is recognizing the Michigan Dairy’s 50th anniversary this year with an event this August and in-store promotions on its dairy products. The announcements of the Valued Partner Award and the donation were made at MMPA’s 101st Annual Meeting in Lansing, Michigan. Approximately 400 members and guests gathered at the meeting today to discuss dairy exports, recognize members, adopt policy resolutions and elect board members. The Michigan Milk Producers Association (MMPA) is a dairy farmer owned cooperative founded in 1916. MMPA serves approximately 2,000 dairy farmers in Michigan, Indiana, Ohio and Wisconsin, handling approximately 5 billion pounds of milk annually. MMPA operates two SQF Level 3 certified manufacturing plants in Michigan and a cheese plant in Indiana. Products made at MMPA’s plants include butter, non-fat dry milk, whole milk powder, cream and condensed skim milk. The Kroger Co. (NYSE:KR) is one of the world’s largest grocery retailers and the nation’s largest operator of traditional grocery stores, with fiscal 2016 sales of $115.3 billion. Kroger employs more than 443,000 associates who serve customers in almost 3,000 supermarkets and multi-department stores in 35 states and the District of Columbia under two dozen local banner names including Kroger, City Market, Dillons, Food 4 Less, Fred Meyer, Fry’s, Harris Teeter, Jay C, King Soopers, QFC, Ralphs and Smith’s. The company also operates 784 convenience stores, 319 fine jewelry stores, 1,445 supermarket fuel centers and 38 food processing plants in the United States. Recognized by Forbes as the most generous company in America, Kroger supports hunger relief, breast cancer awareness, the military and their families, and more than 30,000 schools and grassroots organizations. Kroger contributes food and funds equal to 276 million meals a year through more than 100 Feeding America food bank partners. A leader in supplier diversity, Kroger is a proud member of the Billion Dollar Roundtable and the U.S. Hispanic Chamber’s Million Dollar Club. Incorporated in Michigan in 1909 and headquartered in Novi, The Kroger Co. of Michigan includes 19,000 associates, 126 Kroger stores, 75 fuel centers, 104 pharmacies and the Michigan Dairy.